Wednesday, August 15th: Masses at 7:30 a.m., 12:10 p.m., 5:30 p.m. and 7:30 p.m. 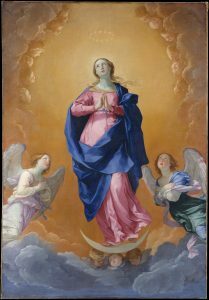 Please join us to celebrate the Feast of the Assumption of the Blessed Virgin Mary on Saturday, August 18th at 4:00pm with a Solemn Mass, and then a parish picnic immediately following the Mass. (There will be no Mass at 7:00pm.) The church will provide hamburgers and hot dogs, and we would like you to bring a dessert or a side dish so that all of us will be able to share a meal and some fellowship. We are looking for volunteers to help set up on Saturday, August 18, 2018 at 1:00pm, and to help clean up afterwards around 8:30pm. Please call Dn. Steve Genovese at 203-943-1352 if you can help with either the set up or clean up. Acompáñenos a celebrar la Asunción de la Virgen María, patrona de nuestra Iglesia, el sábado 18 de agosto, 2018. Iniciaremos con Misa solemne a las 4:00PM y luego el Picnic Parroquial. (No habrá Misa a las 7:00PM.) La iglesia donará hot dogs y hamburguesas. Les pedimos que traigan un postre o una ensalada para que juntos compartamos este día glorioso. Necesitamos voluntarios para el sábado 18 a la 1:00PM para organizar el evento y luego para ayudar a limpiar al final. Por favor llamar al Dn. Steve Genovese al 203-943-1352.